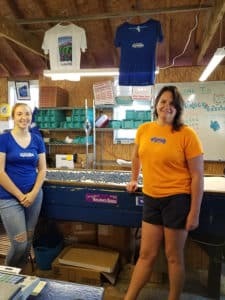 The staff at Mondadnock Berries sorting through some fresh picked fruit! Berry picking is one of my favorite outdoor activities when summer rolls in. The Southwest corner of New Hampshire has so many agricultural experiences that each feels unique and special. 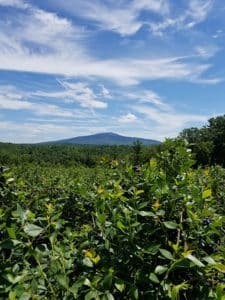 Monadnock Berries, located in Troy New Hampshire, is one of those special places. Monadnock Berries is tucked up in the hills of Troy. As you pull into the parking lot, the farm stand is to your right. But take a quick stop to visit with the farm animals on the left before collecting your bucket for berry gathering. 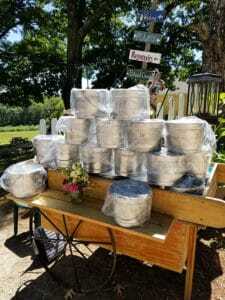 The metal bucket lends an authentic air of another era, but the addition of a holed bag to aerate the berries while picking tells of Monadnock Berries’ current knowledge of the art. Now it’s time to take in the picturesque fields of blueberries, currants and raspberries surrounding you. And in the distance, the farm has the perfect view of Mount Monadnock. Tin buckets prepped for picking! On my trip this past weekend, the weather was perfect. 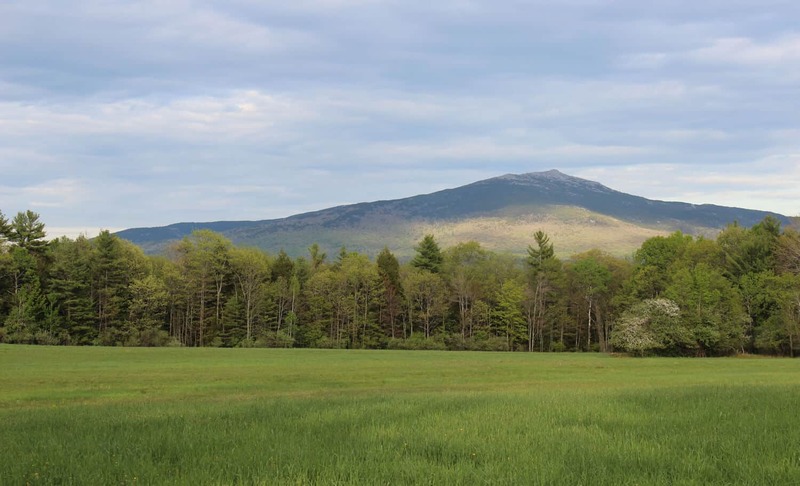 Mount Monadnock, visible wherever I stood while picking, was gorgeous as always. Families were out with their kids of all ages, everyone loading up metal buckets full of berries as they moved from bush to bush. Making our way past the currants, we headed to the opposite end of the fields for some raspberries. Thankful we found them ripening on the vines, we know the raspberries will be gone in no time! 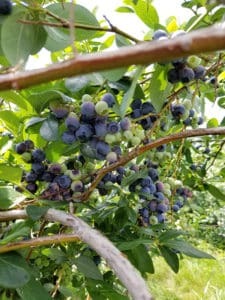 Blueberries on the bush – couldn’t wait to eat them. Inside the farm stand, you can also buy some artisan crafts, drinks made with their berries, and other finds as well. The staff was super friendly and helpful, giving directions on where to go and bagging up your fresh picked fruit. The farm stand at Monadnock Berries is open until 6 most days, while the fields close at 5pm. Even on hot days like the one I went the breeze coming up the hillside was enough to keep us cool, creating a perfect summer excursion that everyone in the family can enjoy. AND – brought to you by the same folks is Granite Brewery – a wonderful way to finish your day is with a taste there…but that’s for another blog! This entry was posted in Uncategorized by Meaghan Woods. Bookmark the permalink.